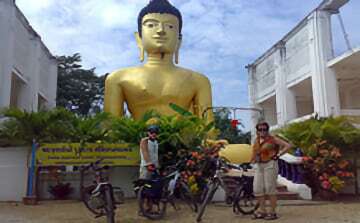 Our bicycle tour Chiang Mai Paradise is a one day cycling adventure through the South-Eastern part of Chiang Mai. The excursion starts daily at 9:00 AM from our office. The route takes you over quiet country roads, and through small villages, where farmers work the rice fields, while their wives fill their days making terracotta. A little further on we stop at an old temple, where the oldest people from the village make flowers and garlands of paper and textiles, which are used during Thai weddings and Buddhist ceremonies. We continue our bicycle tour Chiang Mai Paradise through the rice fields, and make a short stop at a farm where mushrooms are cultivated. In this area we see many kinds of industry. We see women from a local village making rice crackers, banana chips, soya bean paste and many more Thai traditional products. Of course we make sure you have the opportunity to sample some of these local delicacies. Meanwhile, around noon we have lunch at a typical local restaurant. While the chef is preparing our food, there’s time to stroll over the market next to the restaurant, and look at all sorts of different goods. Our journey continues, following the Ping River and over country roads. Did you ever wonder what is in the pieces of bamboo they sell alongside the roads? Here you’ll learn the answer as well as how many different variations there are. In this area, most of the farmers grow lettuce, cabbage, ore other vegetables. After another nice ride we arrive at a small restaurant beside the water, where we have a local cup of coffee or some herb juice. We visit a 700 year old Chedi, and see how the 2 styles, Lopburi and Burmese, are combined. After a stop at the local market, where you can sample some local fruits or snacks, we arrive back at our office around 16:30. During our bicycle tour Chiang Mai Paradise we take a break every hour for a short rest and drink. The stops and places of interest may vary depending on seasonal activities. Any healthy person who is able to ride a bicycle can join this trip. This excursion will leave you with an unforgettable experience and memories of your stay in Chiang Mai which will last a lifetime. Chiang Mai City Culture is a half day cycling tour that takes you through and around the rich centre of Chiang Mai. Colors of Chiang Mai is a 4-5 hour amazing bicycling tour through the southern part of Chiang Mai. ‘Secrets of Lamphun’ is a 2 day cycling excursion that takes you through the enchanting province of Lamphun. ‘Chiang Mai Treasures’ or ‘Treasures of Chiang Mai’ is a 3 day cycling adventure through Doi Saket – San Kamphaeng – Bo Sang – Chiang Mai. Participants are taken to areas where it looks like time stood still.